One of my coworkers just got engaged. (Congrats again, girl!) I don't know how long it took her fiancé to pick out the ring, but the more I learn about ring shopping, the more complicated it sounds. You have to spend enough that it's lifelong quality, but not so much you put yourself in lifelong debt. You have to choose a high-quality band and stone(s). Just as important, you need a high-quality, trustworthy jeweler. They'll make or break the experience in the long run. You know what's bigger, more permanent, and much more expensive than an engagement ring? An inground pool. So how do you know if your pool builder is a good one? River Pools specializes in fiberglass pools (both manufacturing and installing them). We also educate on all 3 pool types—and all aspects of the pool journey—so that you can make the best decision for you and your family. A big part of that decision is choosing who will build this pool you've been dreaming of. Yes, price is a huge factor. Everyone loves a discount. But if you focus on price over the quality of the pool contractor, you may find yourself in trouble down the road. Here's your personal guide to evaluating pool builders. Yelp, Google, and Facebook are your friends here. Everyone gets dinged once in a while. But if you have 50+ reviews, the average tends to be representative of how the customers feel. On average, a pool builder should be rated 4+ out of 5. And if they're rated lower than that? The majority of the people rating them had a mediocre or even straight-up bad experience. That's not a risk I'd take. I won't even stay at a 3.5-starred hotel. And that's incredibly low-commitment compared to a pool project, which costs tens of thousands of dollars and stays with you for decades. It can be equally as telling to see if and how they respond to negative reviews. What if there aren't any reviews? Sometimes a pool company doesn't have many online reviews at all. That doesn't necessarily indicate anything one way or the other. It's insufficient data. But it does mean you have to be extra aware as you vet them. Their reference list is even more important in this case. Basically, if a pool builder is doing a good job, they should be able to provide the vast majority of their customers as references. At River Pools we've been fortunate to have installed well over 1,000 fiberglass pools over the years and our reference list contains virtually all of our customers. We only point this out because if we can do it, anyone can. Feel awkward asking for references? How many pools did you install last year? If the contractor tells you they installed 40 pools, but there are only 15 people on the reference list... You see where I'm going? Bad news. What pool, options, and accessories did you choose? How did the pool builder handle challenges and problems when they arose? If you could do it over, would you use the pool builder again? They should have images of their own pool projects. Pool contractors should provide photos of the pools they've built themselves, not stock photos or pictures from someone else's site. It's okay to ask if the images are from their pools. What if they're a new business? Newly established pool builders may not have a lot of their own photos to share. For example, some of our River Pools Certified dealers don't have a lot of their own photos to show yet. In these cases, the other 6 points carry more weight. The pool builder should have a clearly defined sales system. Not just "Hey, I'll be there sometime tomorrow afternoon!" but "Here's how the process works. Step 1, we have a conversation. Step 2, we..."
How do you find out their process if they don't offer it upfront? Ask! Look for a clearly laid-out planning and execution process as well. Exactly what the process itself is isn't as important as the fact that they have one. 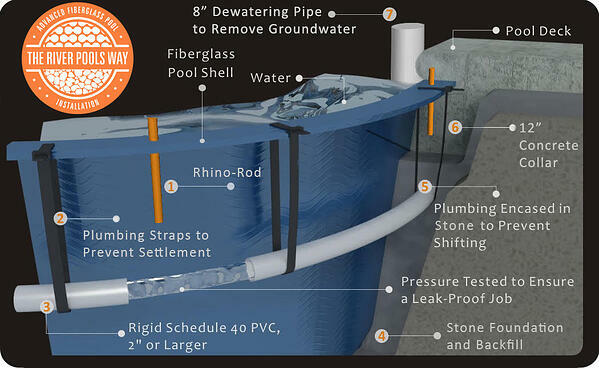 If they're a fiberglass pool installer, they should follow best practices, not just the "industry standard" minimum. A workmanship warranty is the guarantee a pool builder puts behind their own work. The workmanship warranty should cover major issues like plumbing leaks, fittings leaks, structural settlement, or pool or patio movement. Here's the thing: the industry standard for a workmanship warranty is one (yes, 1) year. Many of these issues won’t happen within the first 12 months after construction. Thanks for nothing, freeze/thaw cycles. Many pool owners who have these issues and only received a 1-year workmanship warranty from their pool builder are stuck footing the bill for these repairs. A 5-year workmanship warranty therefore speaks volumes over a 1-year alternative. Simply put, any builder who says they've never made a mistake is either brand new or not being honest. Ask about their challenges. Do you feel like they're open and honest about them? "Tell me about the biggest mistake you guys have ever made on a pool project." If they say they've never had one, they're probably not telling the truth. How does River Pools compare? "Some things are easier said than done." "Do as I say, not as I do." Pick a cliche. I've got more. The point is, as fiberglass pool specialists, we at River Pools take pride in doing exactly what we say good pool companies should do—and in being transparent about it. After all, integrity is the first of our 6 core values. Learn our core values, focus, and mission statement. See the details of our advanced manufacturing and installation techniques. Our home base is in Virginia, and our certified pool dealers operate across the US. Give us a shout (figuratively, please)—we'd love to chat with you about your dream backyard oasis! Editor's note: This blog article was updated on January 2, 2019.